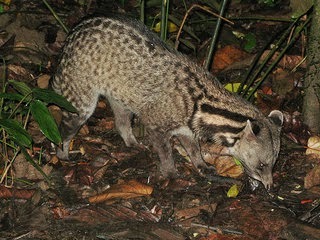 There were plenty of correct answers to last week’s Mystery Creature, it was a Malay Civet (Viverra tangalunga). Also known as the Malasian civet or Oriental civet this animal is found on a number of Indonesian islands, the Malay peninsula, the Philipines and Singapore.Their body length is between 50 and 100 cm from head to tail. They are greyish in colour with black spots on the torso, a black stripe down the back and upper part of the tail. There are usually three black stripes on each side of the neck and the under part of the tail is banded black and white. Found in a range of habitats including forests, cultivated lands, grassland and even on the outskirts of villages. These animals like to stay in the cover of vegetation during the day, emerging into the open areas at night (primarily nocturnal). Although land dwellers they are capable climbers. They are good hunters, eating small mammals, reptiles and frogs. They are omnivores and will eat fruit and vegetation also. A litter is made up of one to four young and a female can have two litters a year. The young are kept in dense grasses or in a shallow hole in the ground. Civets are usually solitary, non aggressive animals,with a life span of up to 15 years. Civets are of particular interest to humans for two reasons. The first is the secretion of a type of musk, called Civet that is used in the perfume industry. The other is in the processing of a rare and valued type of coffee called Civet coffee. Civet coffee is a rare and exclusive coffee that has been prepared from partially digested coffee cherries, collected from the dung of the Asian palm civet. The coffee bean is exposed within the digestive system of the civet and is then partially digested in the stomach. This is thought to add to the unique flavour and aroma of the coffee. A cup of civet coffee can cost up to $100 in some parts of the world although the production of this rare coffee is often thought to include entrapment and force feeding of the animal in a cruel and inhumane fashion. Note: Many species of civet are similar in colouring and markings. The image source of the above photo identified the civet as a Malay civet but without a reference to scale and an image of the animal from different angles it is possible that the civet in the above image is a small Indian civet and not a Malay civet. According to https://www.facebook.com/DavidTwamleysZooWorld it’s a Civet. David is of course right :0) …. does he know what types of Civet?… just to up the challenge :0) it is not a great photo so not too easy!